Located in the revitalized Port Area of io de Janeiro, the land is positioned in an area of any challenges. The first question is memory and heritage, which historic houses give life to a population that has lived there for generations. The second major issue is the uncertain future of the region with all the transformation process that has been taking place in recent years. New and glazed buildings has been built to a scale never seen in the city so far. How to create an intermediate project between the new and the historical, seeking progress while enhancing the existing? 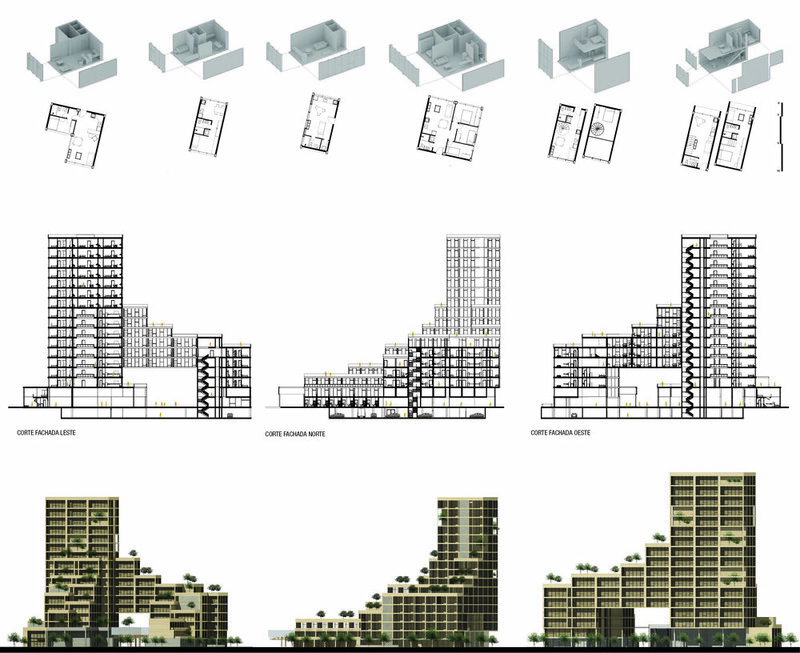 Seeking an intermediate scale between existing historical houses and new super tall buildings that begin to be imposed in the area, the proposal is to emphasize the heterogeneity of scales and local typologies, trying to show the possible dialogue between what exists and what has been built in a questionable way. However, volumetric studies were carried out, looking not only at intermediate scales, but also at contemplating existing views, better positioning for solar incision, and creating and enhancing public spaces within the super block that sits the project. The program consists mainly of up to 312 modular housing units of 32 m², which can be resized (such as combining two units) and reach a minimum total of 240 units, some of them consists in 1 module, 1.5 module or up to 2 modules. As a gradation between the public space from the street to the private one of the dwellings, new actors enter the project. From the ground floor, there are the most public programs, such as plaza, commerce, and multipurpose pavilion of events, that adapts to the temporal transformations, just as it happens in the surroundings. From the second floor, there are semi-public spaces, in areas of common use, as well as collective terraces along several levels, which makes the smooth and gradual bridge of public, semi-public and private intermediate. Concrete, glass and steel describe not only the reality of local constructions, but also global ones. With the opportunity to insert a building as the new context in the region, there is also the opportunity to challenge the new constructions, which are based on traditional building materials, leaving aside new, more sustainable proposals for civil construction. As a starting point for the project, we chose a clean, fast, and environmentally correct materiality, found in the CLT (Crossed Laminated Timber). Among the great advantages found in the material, which is recently under development for such a scale of construction, are the easy pre-fabrication of elements, possible reuse of material, and unlike steel, the production of columns and beams, can simply be replanted, and do not release CO2, but instead retains gaseous pollutants.The CLT constitutes all housing units, which are prefabricated, are taken semi-ready to the ground and then stacked form the building.